Bird’s-eye view of the Soane Family Tomb (1816), painted by George Basevi, a pupil of Sir John Soane. Painted in the year of its erection, Basevi has here removed the tomb from its graveyard setting and imagined it nestled in a tree-laden valley — Source. When London’s King’s Cross train station expanded north in the mid-1860s, the tracks cut through one of the oldest sites of Christian worship in the city: St Pancras Old Church. The novelist Thomas Hardy, at that point working as an architect, was charged with the task of clearing the site to make space for the station’s expansion north. Hardy exhumed the dead and placed their gravestones in a spiral around a tree. Today this tree remains, but the inscriptions are increasingly difficult to read, given the tree’s roots have begun to envelope the stones. Elsewhere in the cemetery, the gravestones mark the final resting places of other notable figures: there is Mary Wollstonecraft, writer of A Vindication of the Rights of Woman (1792) the mother of Mary Shelley, author of Frankenstein (1818). Nearby is an imposing mausoleum inscribed with the name Sir John Soane, marking the final resting place of the collector-architect, whose eccentric house remains on Lincoln’s Inn Fields, as documented in the guide Description of the House and Museum of Sir John Soane (1835). View in the Museum: Looking Down to the Belzoni Sarcophagus and Towards the Picture Room, an image featured in Description of the House and Museum of Sir John Soane (1835) — Source. The mausoleum was erected in 1816, designed by Soane himself in memory of his wife Eliza, who died the year prior. Like much of Soane’s designs for London, of which only a few were realised, the mausoleum is built out of gleaming Portland stone, propped up in classical ruin. When Soane died in 1837, he joined his wife and their elder son John, who died prematurely in 1823, in the tomb that he had designed. 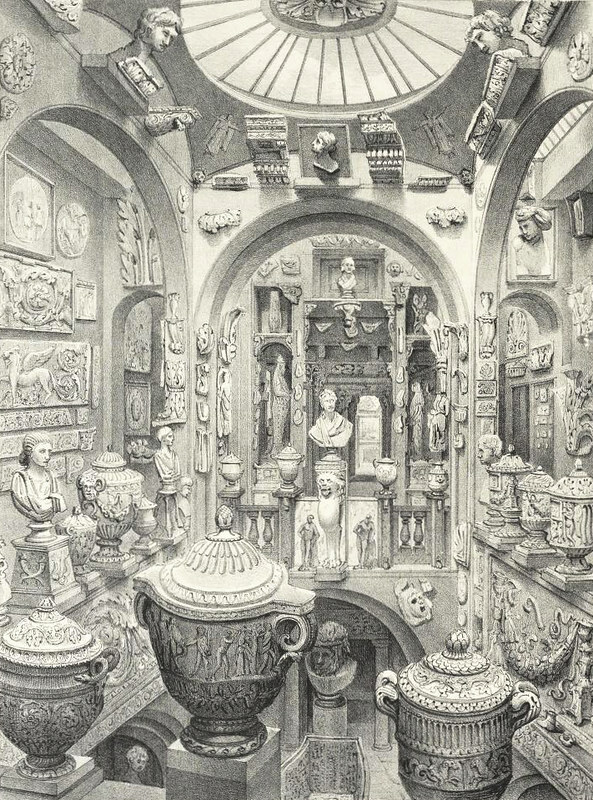 Illustration of Soane’s tomb, featured in Description of the House and Museum of Sir John Soane (1835) — Source. Visible from the graveyard and sharing its name with the same martyr, St Pancras, is the sister station to King’s Cross, a Victorian gothic masterpiece built by Sir George Gilbert Scott. Just under half a century after this station opened, the architect’s son, Giles Gilbert Scott had entered a competition to design a telephone box. 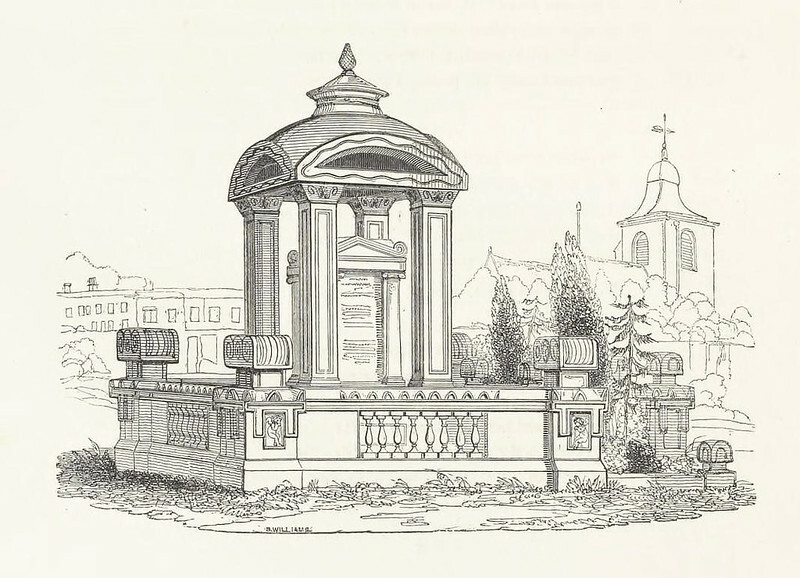 He trod around the graveyard of St Pancras Old Church, in the shadow of his father’s masterpiece, and found inspiration: the central domed structure of Soane’s tomb. Though the design of the iconic red telephone box evolved over the years, from the K2 in 1926 to the K6 model in 1935, the structure remained the same: a column-like construction capped, like the tomb, by a domed roof. Giles Gilbert Scott’s design for GPO telephone kiosk number 2: plan, elevations and section, 1924 — Source (not public domain). Though Nikolaus Pevsner wrote that the nineteenth century “forgot about Soane”, it was ironically through his funereal-architecture that his spirit was revived. The ruined classical architecture of death had become one of the utilitarian icons of the twentieth century. These boxes are now relics on the streets, preserved by English Heritage and frequented by the occasional tourist, the occasional commuter with a flat battery, and the occasional poster of so-called “Tart Cards” that Gilbert and George (no relation to Sir George Gilbert Scott) arranged into artworks in 2011. Do these boxes still have a purpose? A number of years ago, a company selling coconut water ran adverts on the sides of old phone boxes in London: “FOR PEOPLE BORN AFTER 1994, THIS IS A PLACE ONCE USED TO MAKE PHONE CALLS”, the text read. Like their architectural inspiration, these boxes now act as a memorial to a form of life now passed.